We slept last night on a very thin futon with no extra padding, and with a thick pillow filled with real rice. Nowadays, most traditional Ryokans and Minshuku guesthouses in Japan, while still keeping to the tradition of rice pillows, have switched to using pillows filled with synthetic pebbles, which are odorless, collect less germs and somehow feel “softer,” if you can get over the feeling that you are sleeping on gravel or on a sack of rice. Last night’s pillow smelled a little like someone’s beer breath. I cannot say that I was very comfortable. At night my feet were throbbing, and when I woke up to pee during the night, I could see the flashing red lights of road construction right below us. Breakfast was a bowl of Natto (fermented soybeans) which I like but which Jules doesn’t eat, a bowl of tiny fish that look like tiny worms that both Jules and I don’t eat, a hard-boiled egg, steamed rice, miso soup, strips of nori and pickles. The friendly guesthouse owner made us a care package for lunch of Onigiris (rice balls) with umebushi and with pickled daikon, bananas, cookies, sweets and Yakult probiotic drink. As it turned out, her generous packed lunch was the only food or drink that we came upon on our long road of walking for hours. There were also no villages along the way and no vending machines to buy water or tea. We carried only one bottle of water between us and it was a very rainy day which quickly turned into a steamy day. The guesthouse owner told us about Yoshi’s hut, which is a place where the owner offers free food and drinks to passing pilgrims. The generosity of the owner and his hospitality hut is so well known, that it is even marked on our map. We did not know what to expect, but after five hours of walking an incline towards the mountains, any place that offered a bench to sit on, or water to drink sounded dreamy to me. When we came upon Yoshi’s hut, I felt like a kid in a candy store. There was a small fridge with ice cold Japanese tea, a basket full of candy and chocolate, packages of soup with noodles, hot tea and all sorts of goodies for pilgrims. The owner of the house above the hut, came down to meet us. He was a sweet, kind man who told us that he had walked the pilgrimage himself and knew how hard it was. He urged us to eat the noodles, but we had our Onigiris with us, and only needed to take off our shoes and wet socks, rest, drink cold tea and eat some chocolate. He asked about where we were planning to stay tonight, and how far we planned to walk today. We told him that we had booked a room at Kazaguruma, which we thought was a Minshuku. He leafed through a stack of brochures and told us that Kazaguruma is actually a small local Sake brewery, and showed us a picture of the owners and their famous “Clouded Sake” made from not filtering out the Koji (sweet rice) which is usually removed from commercially produced Sake. We thanked him for his hospitality and kindness and his most generous soul and we put back on our wet socks and wet shoes. He even had a first aid kit for blisters, with scissors, adhesive tape, antiseptic creams, and an array of band aids! He also lets me fill my bottle with more ice tea for the road. Jules adds: “The rain that we had for the first three hours or so of our walk, despite my rain coat, rain pants and umbrella, quickly saturated my socks and shoes. The soggy socks made the blisters I already had that much more difficult. In keeping with the Pilgrim’s Oath, I neither complained nor felt disheartened, but walking did become that much more challenging. Yoshi’s Hut, our first opportunity to sit down after many hours of walking, was a gift from God for me! As the weather cleared, we started to enjoy the walk. 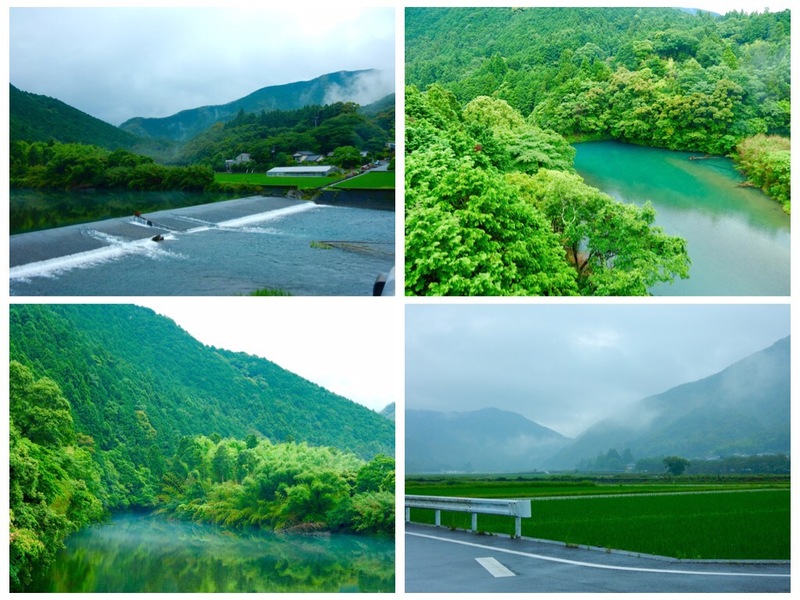 We passed by dozens of waterfalls, many rivers and creeks, vast rice fields and beautiful forests. Because we had chosen to walk on another route, Kazaguruma was actually a few kilometers out of our way. Walking even four kilometers out of your way at the end of a day, feels like a lot of walking…. Kazaguruma Sake brewery came into view before I could read the name on the sign. The building looked good and as I was walking towards it, I was hoping that it would be our place for the night. When I could finally read the sign, I was so relieved! The friendly owner welcomed us in. She must have seen how tired we were, as she immediately served us cups upon cups of unsweetened Mugi Barley Ice tea, bananas and a bowl full of chocolates. She said that she will drive us to the place that we will be staying for the night. She packed a bag of chocolates for us and some Yuzu drinks, and we got into her car. She took us to a little house that was to be our accommodation for the night. It was designed as a traditional Japanese farmhouse, with two separate sections. One section was for sleeping, which had lovely Tatami mats floor and had a closet full of blankets, futons and pads, already covered in clean sheets. The other part of the house had dark wooden floors with a traditional fire pit in the middle with a chain hanging from the ceiling, on which they hang a pot of tea to boil over the fire. This fire pit is also used to cook, grill and roast food, which is served on the wide wood trim that surrounds the fire pit. There are cushions to sit on the floor around the fire pit. We did not cook our own dinner, but we enjoyed sitting around the fire pit and drinking hot tea. There was also a small kitchen, a toilet and a washing machine, a shower and a deep bathtub. For us, it was Heaven. It was a quiet, rural place between rice fields, with no bus, train or cars going by, serene, peaceful and full of character. At 18:00 in the evening, the husband showed up and drove us to dinner through rice fields which were edged with colorful Hydrangea flowers in full bloom. His wife had prepared a delicious dinner in the house across from their brewery. They ate dinner with us, offering us their special Sake which was cloudy white with grains of soft rice, and very delicious. She served us many yummy dishes, among them cooked bamboo shoots, cooked Kombu seaweed tied into ribbons, fresh Sashimi, Tuna Tataki in vinegar, tempura of herbs and vegetables from her garden. I did not recognize one of the herbs, so she went into the garden and brought back one of the herbs that she had fried in tempura batter. This herb is not usually eaten raw, as it is too bitter, but it tasted superb as tempura. She cut up some fresh orange for us to take to our farmhouse as dessert. Over dinner they told us that they have three children and nine grandchildren, and that he is 81 and she, 75. Back in our room, I built a high bed with two layers of foam mattresses for each of us, topped them with two futons each and with nice clean blankets. Like everywhere we stayed in Japan, we did not bother locking our doors. Most traditional Japanese doors do not even have a lock on them anyway. That night on the layers of futons, I slept very well. Jules said that the blisters on his foot hurt during the night. Early morning, as the sunrise flooded into our little Japanese house, I had nice, happy dreams. It is going to be good weather today. My feet are doing very well, and I hope that Jules will not suffer too much on our walk today.